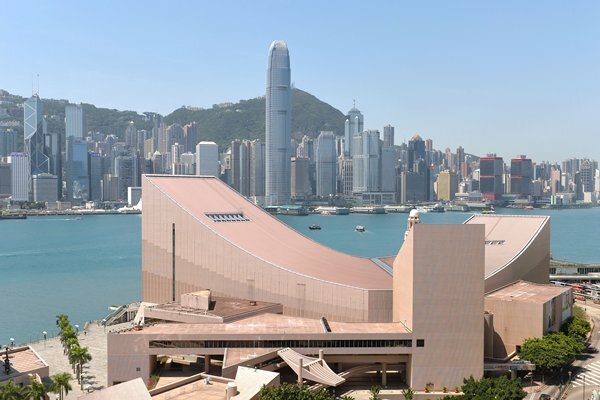 The Hong Kong Arts Centre, Hong Kong’s sole independent, non-profit, multi-arts institution, reopens following a sweeping renovation of nearly three years. The result, I’m pleased and proud to say, is an Arts Centre that is more environmentally friendly, more accessible and more sustainable. It is poised and primed to promote Hong Kong and Asian contemporary arts and culture to our community, to the region, and to the world. For that, I’m grateful to the Hong Kong Jockey Club Charities Trust. The Trust, together with private donations, led the way in funding the refurbishment. The reopening of the Hong Kong Arts Centre is marked by a major exhibition which will be open to the public tomorrow – Wan Chai Grammatica: Past, Present, Future Tense. For that, my congratulations to the exhibition’s guest curator, Valerie Doran. Rooted in the creative district that is Wan Chai, the exhibition is multi-generational, multi-disciplinary and multi-cultural, featuring some 20 artists either from Hong Kong or intimately connected with our city. The exhibition marks the return of the Arts Centre’s flagship exhibition series, an annual event designed to enrich our art scene. As someone who was brought up in Wan Chai, in a tenement building on Gloucester Road not far from here, the theme of this exhibition carries some personal attachment. On several previous occasions of speaking at the Arts Centre’s functions, I mentioned my personal experience, not so much as a neighbour to this wonderful facility, but as a mother bringing her young children to come to the Arts Centre for different types of extracurricular activities. I was therefore pleased to be able to offer some tangible support for the Arts Centre by hosting its anniversary fundraising gala at Government House in March this year, during which outstanding artwork was auctioned to raise funds in support of the Arts Centre and its community programmes. I did so because I believe in the Arts Centre and its mission. I also believe in the power of the arts to make Hong Kong as culturally vital as it is economically vibrant. My Government is determined to realise that goal. In this year’s budget, we set aside $20 billion to develop and expand our cultural facilities. We also added $500 million to boost our museum collections and holding exhibitions. And one of the world’s biggest cultural projects, the West Kowloon Cultural District is rising by the waterfront here in Hong Kong. By end of the year, I’m pleased to say, the Xiqu Centre, the Cultural District’s dedicated Chinese opera house, will open. This will be followed by the Art Park and the Freespace outdoor performance venue which is targeted to open in 2019. The East Kowloon Cultural Centre now under construction is due for completion in late 2020. Meanwhile, the foundation works for the Lyric Theatre Complex, a performing arts venue for a wide variety of events including drama and musical performance with a focus on dance, have started with a target of opening in 2022. On the visual arts side, the West Kowloon Cultural District will feature two world class museums as well, namely the M+ Museum and the Hong Kong Palace Museum. Together with the renovated Hong Kong Museum of Art which is due to reopen next year, we do expect a very vibrant art and cultural scene in the future, right here in Hong Kong. The reopening of the Hong Kong Arts Centre, with its renovated space and facilities, will no doubt be an important part of the picture. We wish Arts Centre every success in the next 40 years, and will continue to count on the Arts Centre to, as stated in its vision statement, enhance Hong Kong’s position as an artistically vibrant city through the promotion of contemporary arts and arts education for the whole community. Chief Executive Carrie Lam gave these remarks at the Arts Centre 40th Anniversary Flagship Exhibition opening ceremony and the centre’s reopening celebration ceremony on September 29. Looking ahead, I am very confident that Hong Kong’s art and cultural scene will boom, because of several developments. One is, of course, the much talked about West Kowloon Cultural District which is about to materialise in a very visible way. I’m sure you can already see this iconic building, the Xiqu Centre, but it is on the performing arts. On the visual arts, we will have M+ ready by the end of next year and perhaps open its doors to the people of Hong Kong and visitors in the year 2020. This will be followed by the Hong Kong Palace Museum in 2022. But prior to that, next year, we will reopen the Hong Kong Museum of Art with an expansion of 40% in arts gallery exhibition space. Adding to that, in the last couple of months, the Hong Kong Special Administrative Region Government, and the arts museum in particular, has received two wonderful donations. One is from Chih Lo Lou, which is a great collection of late Ming and early Qing paintings. The other is the outstanding works of the late Wu Guanzhong. So when the arts museum opens its doors again next year, you will be able to see these wonderful collections in their dedicated gallery. At this point in time, it’s really for us to congratulate Fine Art Asia and Ink Asia for being the pioneers in doing private art fairs in Hong Kong, and I’m sure that, together with the Government’s efforts, Hong Kong’s cultural scene will scale new heights in many, many years to come. With those remarks, I wish this year’s Fine Art Asia and Ink Asia every success and hope that you will come back more often to support these fine people who are promoting Hong Kong’s arts development. 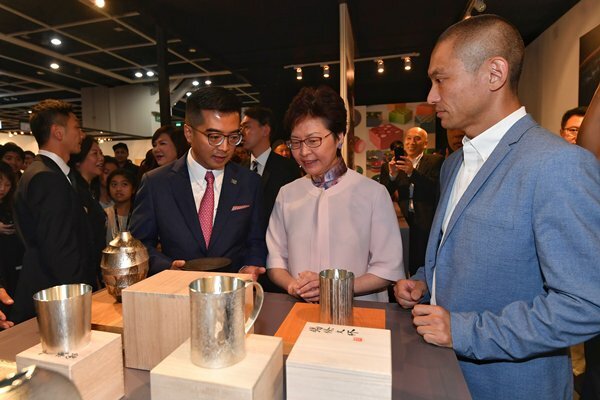 Chief Executive Carrie Lam gave these remarks at the opening ceremony of Fine Art Asia 2018 & Ink Asia 2018 on September 28. Technology will become increasingly critical to the success of the Belt & Road Initiative, which is all about enhancing connectivity between countries. Originally envisioned as encompassing Asia, Africa, the Middle East and Europe, it has now extended its vision and its reach to Latin America. Given its vast political and geographical magnitude, connectivity can only be enhanced efficiently with the help of technology. When we talk about trade along the Belt & Road today, innovation and technology is inevitably part of that discussion, and it’s fintech that increasingly dominates the conversation. Fintech can enable cost-effective financial services, while promoting cross-border trade and investment along the Belt & Road. Given its clear potential in lowering the cost of doing business, fintech promises a level playing field for business, and that can only spark further innovation. Apart from fintech, lawtech is also becoming increasingly important. Hong Kong positions itself as the region’s legal and dispute-resolution services hub and has been consistently rated as the one of the most preferred seats of arbitration outside Europe. What distinguishes Hong Kong is the rule of law, backed by the trusted common law system, the independence of our judiciary, and the abundance of well-qualified legal professionals. On the latter, some 900 local solicitor firms and about 85 foreign firms practise here. They are well versed in both the international and the Mainland’s legal and regulatory landscape, and will most assuredly play a pivotal role in the progress of the Belt & Road Initiative. Traditionally, legal practitioners handle highly confidential information in their daily work. Without mature technology in providing a watertight protection for information security, the legal industry was not among the first to embrace the digital transformation. But now, given the substantial and continuing advances in cloud security, the legal sector is increasingly seeking innovation with a view to capturing the time and cost savings there for the taking. In addition to machine learning for legal research and AI-driven programmes for providing simple legal advice, efficient and effective online legal services have an enormous potential, particularly in the context of the Belt & Road Initiative where a large geographical area is covered. In anticipation of a rise in cross-border transactions as a result of the initiative, private sector stakeholders in Hong Kong, including the Law Society, are already actively exploring the creation of an e-platform known as the eBRAM, that is the Belt & Road Arbitration & Mediation Centre, to facilitate the conclusion of transactions as well as dispute resolution. The group in charge of eBRAM came to see me a month ago asking for money and I tried to respond as positively as I could. Also because of the wide geographical coverage of the Belt & Road, there are inevitably language barriers that have to be overcome in the course of co-operation. In fact, the Belt & Road region is home to more than a thousand languages and dialects. Translation technology and language databases will be in considerable demand to meet the needs for effective communication, particularly when it comes to contracts. I have been told that the eBRAM will also seek to address these issues. My Secretary for Justice will tell you more about this platform later this morning. My Government has made innovation and technology a policy priority, which I believe will benefit all sectors, including the legal sector. Hong Kong’s strengths lie in R&D, in technology adoption and start-ups and a deep talent pool. In terms of technologies, local universities and research institutions in Hong Kong possess strong capabilities in blockchain, AI, robotics, facial recognition and related fields. At the Hong Kong Science Park and Cyberport alone, some 300 tenants and incubatees focus on AI, robotics and data analytics. AI technology is particularly important for the provision of online legal services. 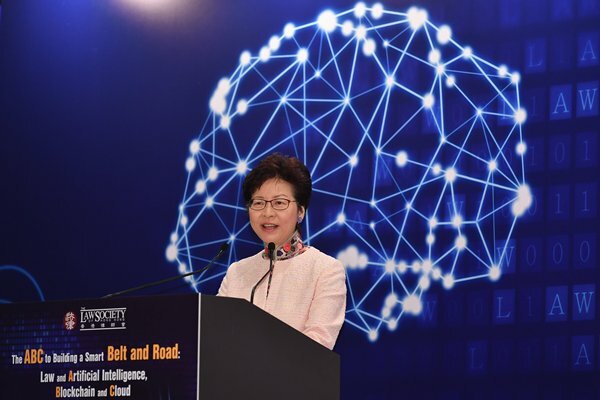 The Government will devote more resources to enhance Hong Kong’s R&D and application capabilities in the AI field, train relevant talents and support technology start-ups to boost the development of AI technology in Hong Kong. On enhancing R&D capabilities, we have earmarked $10 billion in this year’s Budget for setting up two research clusters to attract the world’s top scientific research institutions and technology enterprises to Hong Kong for conducting more midstream and downstream R&D projects in collaboration with our local universities and scientific research institutions. One of the research clusters will focus on AI and robotics. I am pleased to note that we do have some achievements on the AI front already. Last year, the Hong Kong University of Science & Technology became the first Asian institution admitted to the Partnership on AI to Benefit People & Society, an international consortium founded by such technology giants as Microsoft and Google to promote AI development. Just last week, SenseTime Group Limited, our home-grown unicorn, has been entrusted by the Ministry of Science & Technology of Mainland China to establish the “National Open Innovation Platform for Next Generation Artificial Intelligence on Intelligent Vision”. And I have earlier announced that the renowned Institute of Automation under the Chinese Academy of Sciences has already agreed to join the aforementioned research cluster on AI and robotics. The Government will also continue to fund R&D projects on AI through different schemes under the Innovation & Technology Fund. With the support of the fund, the Hong Kong Applied Science & Technology Research Institute has been collaborating with different financial institutions to develop blockchain applications in areas like trade finance, mortgage, digital identity management and insurance. The institute has also worked with local banks to develop a smart investment platform which provides investment options through the use of AI, big data analytics and machine learning programme calculations, and developed AI technology on reading different handwritten Chinese characters for enhancing the efficiency of document processing. I believe that, when the technologies have become mature, they will have the potential to be adopted in legal services as well. To encourage enterprises to conduct more R&D activities, including those on AI, blockchain and cloud technologies, we will shortly introduce a new tax incentive under which their first $2 million of eligible R&D expenditure will enjoy a 300% tax deduction and 200% for the remainder. The relevant legislation has already been introduced into the Legislative Council and I hope that it will be passed sooner rather than later. And we have a series of measures to attract and to nurture talent on innovation and technology. Among them is a pilot fast-track Technology Talent Admission Scheme which enables enterprises to attract overseas technology talent in focused technology areas, including AI and cybersecurity. In addition, we have launched a $500 million Technology Talent Scheme, including a Postdoctoral Hub, to provide funding support for enterprises to recruit postdoctoral talent for scientific research and product development. We will also subsidise enterprises to train their staff on high-end technologies. We hope that all these efforts would create a conducive environment for innovation and technology development in Hong Kong. We would welcome the legal sector to join us and embrace innovation and technology, with a view to adding value to our existing business models. I am confident that innovation and technology, coupled with the quality, experience and expertise of our legal professionals, will make all the difference for Hong Kong and for the Belt & Road. Chief Executive Carrie Lam gave these remarks at the opening ceremony of the Belt & Road Conference on September 28. Our banking sector, I’m pleased to note, is indeed more than ready for the arrival of this new era, a new era marked by the unstoppable wave of innovation and technology. Our banking sector is responding, or to be more precise, evolving smartly. Technology has given rise to a more competitive but yet more vibrant market, boosting product offerings and business performance of banks. Turning to our banking industry, technology is no doubt a critical game changer. Not long ago, the idea of doing your banking on a computer, or a pocket-sized mobile phone, would have seemed the stuff of science fiction. Today, of course, it’s everyday life. Hong Kong is indeed the ideal centre for developing fintech. After all, we are one of the world’s leading financial centres. Earlier this month, Hong Kong was ranked third, worldwide, in the Global Financial Centres Index, finishing a scant three points behind London, which just fell short of New York City. The Index rated 110 centres on a wide range of competitive areas. Hong Kong, I’m pleased to report, ranked number one in investment management, as well as infrastructure and human capital. In banking, we finished second, just behind London. To encourage the banking sector’s adoption of the open application programming interface (API), in July, the HKMA published an Open API Framework following a public consultation. Customer confidence is key to the widespread adoption of any new technology. That’s particularly true in banking. To that end, the HKMA’s Fintech Supervisory Sandbox, launched in 2016, gives the industry a stable testing ground for new products. Last year, the HKMA upgraded the sandbox, introducing three new features: a Fintech Supervisory Chatroom for supervisory feedback, direct access to the Chatroom by tech firms and a single point of entry linking up the sandboxes of the HKMA, the Securities & Futures Commission (SFC) and the Insurance Authority, thereby facilitating pilot trials of cross-sector fintech products. Sandbox use has steadily expanded since its establishment. I understand the industry appreciates the sandbox’s ability to expedite new fintech products, allowing banks and technology companies to obtain user and regulatory feedback at an early stage. We are also promoting virtual banks. In May, the HKMA issued a revised Guideline on the Authorisation of Virtual Banks, adapting its existing requirements to better suit the business models of virtual banks. And that is to enable banks, financial institutions and technology companies to promote fintech, and innovation in general in Hong Kong, opening possibilities for them to offer new customer experience. In serving the retail segment, including SMEs, virtual banks can help promote financial inclusion. And I am pleased to note that about 30 applications for virtual bank licences have been received. The Shenzhen Summer Internship Programme, which began in June, enabled 50 Hong Kong students working there with eight fintech companies for six weeks to allow them to experience Shenzhen’s fintech ecosystem. The two cities, I should add, have agreed to provide reciprocal, soft-landing support for fintech. It was designed to support Hong Kong’s development as a high value-added and diversified economy. Created, in short, to attract talented individuals from around the world in a more effective and focused manner. To that end, the talent list features 11 targeted professions with fintech included. We’re also working to expand local talent through our universities, as well as internships, entrepreneurial training and much more. The Chinese University of Hong Kong, last year, introduced a new, four-year undergraduate programme in fintech. Earlier this year, the University of Hong Kong launched Asia’s first fintech open online course, in concert with Australia’s University of New South Wales and a number of industry leaders. And, of course, Fintech Week opening in just over a month, will attract about 8,000 participants from some 50 countries and regions. This year, for the first time, Fintech Week will travel to Shenzhen on the event’s final day, definitely drawing participants’ attention to the opportunities in the Guangdong-Hong Kong-Macao Greater Bay Area. I am very pleased to note that the Hong Kong Institute of Bankers is playing a proactive role in helping the industry to capitalise on the opportunities ahead. 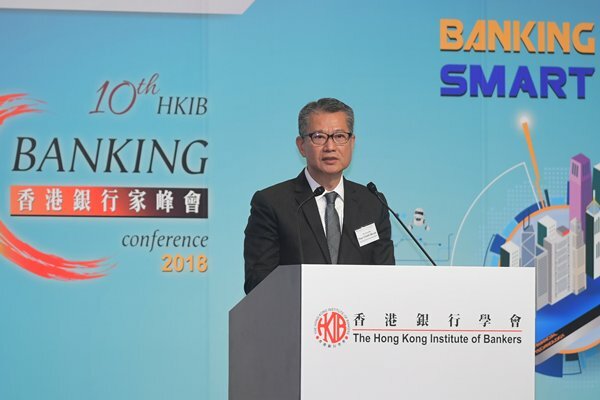 Financial Secretary Paul Chan gave these remarks at the 10th Hong Kong Institute of Bankers Banking Conference on September 27. In his report delivered at the 19th National Congress in October last year, President Xi Jinping outlined the plan to speed up reform of the system for developing an ecological civilisation. He made it clear that the country will promote green development. In particular, the country will create a market-based system for green technology innovation, develop green finance, and spur the development of energy-saving and environmental protection industries as well as clean production and clean energy industries. The country’s initiatives will create strong demand for green funding. Being China’s international financial centre, Hong Kong is well positioned to offer the needed financial services, and capture the opportunities arising from it. The strong demands for green funding and for green investment opportunities have led to the exponential growth in global green finance. In particular, the international green bond market has been flourishing. Governments, multilateral development banks and public entities worldwide have turned to green bond issuances. Indeed, the global aligned green bond issuance for the first half of this year rose 9%, year-on-year, to about US$77 billion. Of that, Mainland China represented 12%, up an encouraging 14% over the same period the previous year. I’m pleased to say that we’re doing a bang-up business in bonds. In the first half of this year, 15 green bonds were issued here. Their aggregate size of US$8 billion comes courtesy of a multitude of issuers, including multilateral agencies and private entities from around the world. In June, the Hong Kong Monetary Authority, in collaboration with the International Capital Market Association and the People’s Bank of China, held two events on green bonds which gathered a total of 1,300 industry professionals and policymakers. Our Securities & Futures Commission and Hong Kong Exchanges & Clearing Limited have also been active in the global green finance scene, promoting market development through such initiatives as the United Nations Sustainable Stock Exchanges. As Hong Kong is building momentum on green finance, we are glad to see the proactive initiative from over 90 market practitioners and business front-runners in launching the Hong Kong Green Finance Association. Indeed, the establishment of the Association marks another milestone in the development of Hong Kong as a green finance hub. It signifies the depth of our market for green finance and industry’s commitment to putting Hong Kong on the world map as a green finance capital. Rest assured, my Government will support the association and other local professional bodies in their work, including in their collaboration with overseas counterparts in the promotion of green finance. 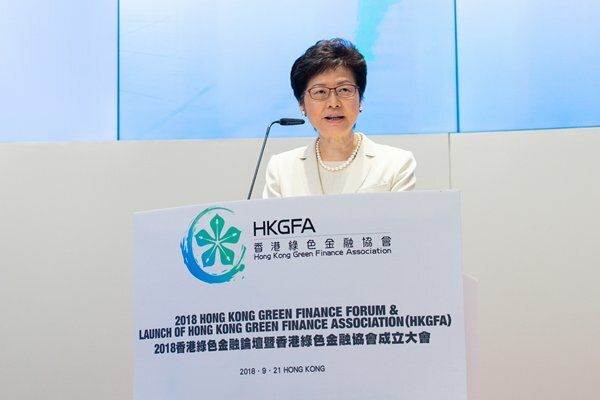 Chief Executive Carrie Lam gave these remarks at the 2018 Hong Kong Green Finance Forum and launch of the Hong Kong Green Finance Association on September 21. My Government is committed to seeing Hong Kong rise as a caring, compassionate and inclusive society, and we are working, with determination and innovation, to realise that goal. I often quoted the following two facts, which really speak for themselves. The first is that some 60% of our recurrent government budget is spent on education, social welfare and medical services. The second is that our spending on social welfare has surged by over 86% in the past six years, with a range of initiatives on social security pioneered by the Commission on Poverty, which I chaired during my time as the Chief Secretary for Administration. Despite the above, I can assure you that we will not hesitate to put in more resources as necessary to meet the complex challenges that pervade our community. Thankfully, the Government is not working alone. Philanthropy has a long and proud history in Hong Kong. The first Chinese hospital in Hong Kong was built by a group of civic-minded local leaders through community fundraising. The University of Hong Kong was founded in 1911 thanks largely to the generosity of an Indian-born philanthropist. Two of the oldest charitable organisations in Hong Kong, the Tung Wah Group of Hospitals and Po Leung Kuk, date all the way back to the 1870s. And through its Charities Trust, the Hong Kong Jockey Club, this forum’s organiser, is among the world’s leading charities, with annual donations in recent years reaching over $4 billion. We have gained international recognition on this front. In last year’s “World Giving Index”, published by the UK-based Charities Aid Foundation, Hong Kong ranked 25th out of 139 countries and regions. And in the inaugural “Global Philanthropy Report”, published earlier this year by the Harvard Kennedy School, Hong Kong finished fifth among 39 countries and cities, based on philanthropic assets as a proportion of GDP. It is an encouraging trend, but given the multitude of social issues that daily confront us, from poverty and rapid ageing to the social exclusion that disadvantaged groups within our society can face, we must be innovative. We need to find ways to expand our sources of assistance and collaborate with more sectors of our community. It’s why we created the Social Innovation & Entrepreneurship Development Fund (SIE Fund) five years ago. The fund was designed to support social entrepreneurs, those focused on developing innovative and successful products and services for society’s needs. Over the past three years, the SIE Fund has put more than $120 million into 140 projects, and I am pleased to say that it’s finding success. Then there’s the Community Housing Movement, launched one year ago this month by the Hong Kong Council of Social Service. With funding from the SIE Fund and Community Chest, the Movement offers an intermediary platform in soliciting and renovating idle residential properties from private developers, and then let them to families in need of transitional housing through eligible NGOs. The Movement hopes to offer, over the next three years, 500 housing units benefiting 1,000 households. Philanthropy is a major source of matching funds for SIE-sponsored social ventures. To date, about 40% of such social ventures are funded with support from a dozen philanthropic foundations. The SIE Fund is also introducing new funding options through equity investment and “pay-for-success”. The latter, sometimes called a “social impact bond”, is gaining interest worldwide. A public-private partnership, it funds public services through performance-based contracts, enabling governments to partner with high-performing service providers using private investment. Public-philanthropy partnerships can enhance expertise, boosting the likelihood of a social venture’s success. For example, the Lee Hysan Foundation, a family institution, is providing advice in the operation of Food-Co, a collaborative effort created to reduce food waste. Food-Co works to get otherwise wasted food to the needy through a network of Hong Kong service operators, corporate food donors and volunteers. Given the prominent role of philanthropy in driving social innovation, four members from our philanthropic community were added to the SIE Fund Task Force just two months ago. It’s a first, but it may be the first of many such collaborations. In short, our efforts in building a caring and inclusive society are evolving, our collaborations expanding and the results encouraging. What we need now is to take our efforts to an entirely new level or in another dimension. I’m talking about the concerted and comprehensive involvement of business, at every level in every industry and sector. I’m talking about embracing the “creating shared value” mindset – truly a transcendent vision – introduced by Harvard Business School Professor Michael Porter who spoke at the 2016 Forum here. In a city or a community meaningfully supported by shared value, business creates economic benefit both for companies and society. They do so by focusing on the needs of societies no less than the needs of their shareholders. Business here in Hong Kong is increasingly aware of this opportunity. Indeed, in the past our companies have been making sizable donations. I am grateful for their generosity but this is not enough. What we need is more than an “add on” to business management and annual expenses. What Hong Kong needs, or what the world and its people need, is the systematic incorporation of creating shared value to the strategy, the mission statement, and the bottom line of every business. It may sound idealistic, but through such forums as today’s, through such resolute commitment and innovation as you bring to this day, I am hopeful that we will sooner than later make it happen. Chief Executive Carrie Lam gave these remarks at the Philanthropy for Better Cities Forum. I’m delighted to repeat what we all know – that our athletes performed brilliantly, returning home from the 18th Asian Games in Indonesia with a record of 46 medals. That includes gold medals in cycling, squash, gymnastics, equestrian and rugby. The two gold medals won in equestrian and rugby are the first ever won by Hong Kong in those events, and in many other events our athletes scored Hong Kong’s best results or broke the Hong Kong records. My Government will continue to support Hong Kong athletes and the development of sports. I have a good track record in supporting sports development in Hong Kong, dating back over a decade ago when I was Permanent Secretary for Home Affairs in charge of sports policy. I still remember vividly that upon my return from the 2006 Doha Asian Games with SF&OC (the Sports Federation & Olympic Committee of Hong Kong, China), I announced at the Hong Kong International Airport together with Tim (SF&OC President Timothy Fok) that the Government would build an indoor velodrome of international standard to provide dedicated facility for the training of our cycling athletes. This velodrome now stands proudly at Tseung Kwan O and has contributed to the excellent performance of our cycling athletes who won three gold, four silver and one bronze at the Jakarta Games, and provide the venue for international competitions enjoyed by the local community. So this experience tells me that dedicated training venue is very important for athletes. I know the Chairman of the Hong Kong Sports Institute, Mr Lam Tai-fai, has another plan for me about building more facilities. I can promise you people that I will give it a very fair hearing. 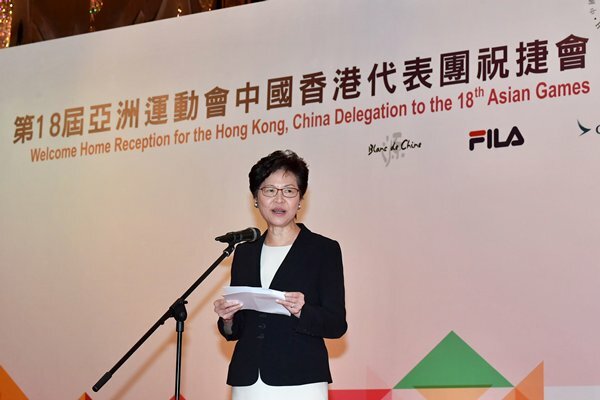 Chief Executive Carrie Lam made these remarks at the welcome home reception for the Hong Kong, China Delegation to the 18th Asian Games and flag presentation ceremony for Hong Kong, China Delegation to the 3rd Summer Youth Olympic Games on September 17. There is a saying that “life is full of uncertainties”. Just when everyone was predicting a bright outlook for the global economy at the beginning of the year, and such positive sentiments prevailed when I attended the World Economic Forum at Davos in January this year, the United States has now imposed unilateral trade measures against Mainland China and some other economies, casting a cloud over future economic prospects. While terrorist attacks and a trade war are of course of completely different nature, I think these events show that black swans do exist and there are always risks in the world. The increasing natural disaster risk, as shown by Typhoon Mangkhut, which was the strongest tropical cyclone hitting us in decades, is another case in point. We cannot avoid risks, so the best we can do is to understand, predict, calculate and manage them. It is no doubt a task which is easier said than done, but thankfully we have the help of actuaries. I know that the Casualty Actuarial Society and the Society of Actuaries – both organisations are well represented here today – describe an actuary as “part superhero, part fortune teller, part trusted advisor”. I am not sure if actuaries can actually fly, but I think the description reflects the importance as well as the complexity and difficulty of their job. Being the leading professionals in finding ways to manage risk, actuaries do need to have very strong analytical skills, business knowledge and understanding of human behaviour in order to perform their functions. We live in a fast-changing world with emerging risks, but they also represent opportunities as we look for more creative ways to tackle them. The spectrum of topics at this conference proves my point, which range from artificial intelligence and cybersecurity to insurtech, longevity risk, the growth of online insurance in Mainland China and the Belt & Road Initiative. These topics and the issues they reflect underline three major developments, which are of interest not only to actuaries and the insurance sector but to policymakers as well. I’m talking about the challenges of our ageing population, the impact of new technology and the burgeoning opportunities opening up, thanks to the continuing economic development of Mainland China. Allow me to share with you my thoughts on each of these areas for the next few minutes. The first topic is ageing population. There is no better place in the world to talk about this topic, for Hong Kong tops global rankings in life expectancy. Men in Hong Kong are living on average up to 81.3 years and women even longer, at 87.3 years, as of 2016. According to our projection, by the year 2066, the life expectancy at birth will be 93.1 for women and 87.1 for men here. In 2026, less than 10 years from now, the number of the elderly aged 85 or above will be the same as children aged below 5. The number of elderly aged 65 or above stood at 16.6% of our population at 2016 and will rise to one in three of the population at 2036, but these days I have chosen to refrain from using elderly figures at the benchmark of 65 as men and women at 65 are really not old. And I am approaching that age. 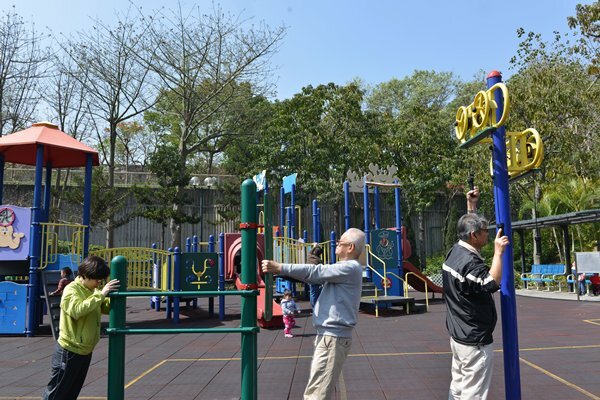 We are seeing many centenarians in Hong Kong now, and they will be even more common in the future. Several years ago, the Geneva Association, a think tank established by insurance institutions, addressed the “Challenge of Global Ageing,” from funding issues to insurance solutions, in a report. The association’s report suggested six critical strategies, namely reduce pay-as-you-go benefit burdens, strengthen old-age safety nets, increase funded retirement savings, encourage longer work lives, encourage higher birthrates and increase immigration. Hong Kong has been implementing policies that are more or less in line with these strategies. They include increasing the old age allowance for the elderly with inadequate retirement arrangements and increasing statutory paternity leave, reviewing statutory maternity leave and expanding child care facilities to better support parents. We recently launched a public life annuity, with a guaranteed monthly payment for life at an expected internal rate of return of 4%. The goal is to help the public enjoy a stable income after retirement. As actuaries, you know how difficult it is for business and insurers to issue commercially viable life annuities, given the low-interest environment and longer life expectancy. That’s why this gap has to be filled by the public sector. We will also introduce tax incentives, encouraging people to take out deferred annuities from insurers and make voluntary contributions beyond the Mandatory Provident Fund system, Hong Kong’s occupational retirement scheme. We want the people of Hong Kong to save early and save more. Naturally we would be interested in how insurance can hedge longevity risk. We believe that an ageing society will create opportunities for the insurance sector. Alongside long-term financial planning products, there could be new demand for insurance against infirmity risk. And for actuaries, my prediction is that your data analytics and risk-management techniques will be used more intensively for policy formulation by governments in managing their aging populations. Hong Kong embraces technology and welcomes talent. At the regulatory level, the Insurance Authority has introduced a sandbox approach, as well as fast-track approval arrangements to encourage insurtech start-ups. And my Government is targeting a range of measures to promote innovation and technology. These include tax incentives to encourage R&D, with a 300% tax deduction for the first HK$2 million eligible R&D expenditure by corporations, and a 200% deduction for the excess. There’s no limit on the expenditure eligible for this tax deduction. The Government will make use of a HK$2 billion scheme under the Innovation & Technology Venture Fund to invest, together with venture capital funds, in local technology start-ups. We have also introduced a HK$500 million Technology Talent Scheme to boost our technology talent. And we’ve just announced a Talent List, which has been designed to attract quality professionals to Hong Kong to accelerate our development into a high value-added and diversified economy. That list currently focuses on 11 in-demand professions, including actuaries. So, for any of you who would like to practice in Hong Kong or plan to start an insurtech company, you are most welcome here. Still with technology, we are developing with the Shenzhen Government the Hong Kong/Shenzhen Innovation & Technology Park, which is located in a place called Lok Ma Chau Loop between our two cities. Shenzhen, a fast-rising innovation hub, is home to IT giant Tencent and the innovative insurer Ping An. The technology park will play a critical role in the emergence of the Guangdong-Hong Kong-Macao Greater Bay Area, which links Hong Kong, Macao and nine prosperous cities in the Guangdong province. Together, the Greater Bay Area counts a population of close to 70 million and a GDP of some US$1.5 trillion. Such economic and consumer clout can only mean bigger market potential for Hong Kong companies and the global companies that partner with Hong Kong. Then there’s the Belt & Road Initiative, which will create opportunities for Hong Kong at a considerably more expansive geographical level. I know that a plenary session on the Belt & Road Initiative will follow my speech, so I’ll keep this brief. I would just emphasise that Hong Kong will play a significant role in the initiative. We are an international financial centre, regularly cited as the world’s freest economy. We are also China’s international financial capital, home to the largest pool of offshore Renminbi. In short, Hong Kong is a natural fund-raising centre for infrastructure, investment and production projects, and a natural hub for project management, given our extensive professional services prowess. That includes risk management, insurance and dispute-resolution services that our Belt & Road partners and their projects may well need. In this regard, my Government has been working very closely with the Insurance Authority chaired by Dr Moses Cheng to enable the development of captive insurance, marine insurance and the underwriting of specialty risks in Hong Kong. We are now considering new tax incentives to fast-track these lines of insurance, together with measures to promote the issuance in Hong Kong of such insurance-linked securities as catastrophe bonds. These and other measures are sure to boost Hong Kong’s status as an insurance hub and risk-management centre, and will surely help us seize the boundless opportunities arising from the Belt & Road Initiative. 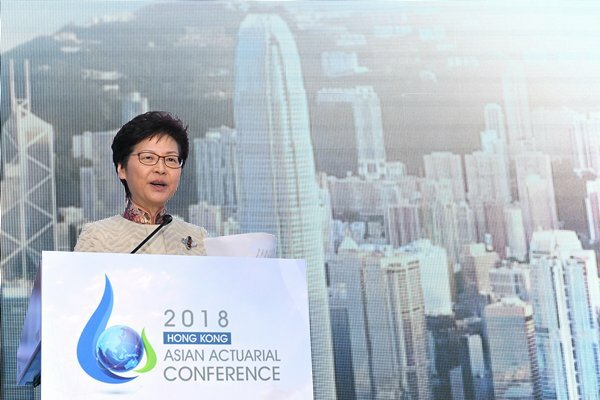 Chief Executive Carrie Lam gave these remarks at the 2018 Asian Actuarial Conference opening ceremony on September 17. Technology is leading the world into a new era, bringing with it a dramatic shift in the global economy. How we do business, how we interact with our customers, our communities, our family and our friends, and in general how we live our lives are being transformed by technology. The financial services sector is no exception. It is being rewired to keep pace with our everyday lives, furnishing retailers and consumers with the electronic means to buy and sell with unprecedented ease and speed. We can now make payments through a wide array of electronic means, with or without a physical card. We can remit money across the globe with a tap of our fingers, with the intended recipients getting the cash almost instantly. We have e-wallets, mobile phone wallets, etc. here in Hong Kong and around the world. Technology is also helping companies, especially SMEs, trade and do business, saving time and papers in the process. Those of you who have the chance to visit the Mainland of China in recent years would know what a cashless society is like, and the convenience it brings. My Government has targeted as a key technology area to focus on and invest in. is a natural evolution for Hong Kong, one of the world’s leading international financial centres and among the world’s most competitive economies. We are blessed with a strategic location and growing economic integration with Mainland China. We are also having a highly enabling and efficient information and communications technology sector, a vigorous financial regulatory framework and the rule of law. And let’s not forget our deep pool of talent in financial and professional services as well as in our research expertise and our tertiary institutions. Last year, the Chinese University of Hong Kong introduced a new, four-year undergraduate programme in . And just a few months ago, the University of Hong Kong launched Asia’s first open online course, with the support of Australia’s University of New South Wales and a variety of industry leaders. We are determined to rise as the region’s and one of the world’s hubs. Indeed, that’s already happening. For investors, Hong Kong has become their first choice in East Asia outside the Mainland. investment here has spiralled in recent years, from about US$108 million in 2015 to US$216 million in 2016, and some US$546 million last year. To fast-track that marvellous momentum, my Government and Hong Kong’s regulators are ready to launch a raft of initiatives. I am told that the Hong Kong Monetary Authority (HKMA) will very soon begin the long-anticipated Faster Payment System. It will set in motion full connectivity between banks and stored value facility operators. That means around-the-clock, real-time fund transfer for peer-to-peer and merchant payments. One will only need to register his mobile phone number or email address with a bank or stored value facility account in order to allow payments to be made to him anytime, anywhere. A common QR code enabling mobile payment is also on the way. A number of stored value facility operators are already providing QR code payments at various locations now. Their services have expanded to a variety of chain supermarkets, convenience stores and even some wet markets and taxis. To expand mobile retail payment and provide greater convenience for both merchants and customers, the Hong Kong Monetary Authority and the industry have agreed upon a common QR code standard, which will soon be launched publicly. Then there’s virtual banking, which is primed to transform the industry. In May, the HKMA issued revised guidelines for the authorisation of virtual banks. It has received about 30 virtual bank applications to date, ranging from telecommunications operators and companies to global banks. I understand that the HKMA hopes to start granting licences to virtual banks by the first quarter of next year. An essential element for is talent. Last month, we introduced Hong Kong’s first Talent List, created to attract talented professionals from around the world. The list focuses on 11 professions and they include specialists in , as well as cyber-security and innovation and technology. We welcome them all with open arms, for we believe that a vibrant mix of local, Mainland and overseas talents can keep our ecology connected to the latest ideas and developments of the global landscape and be most conducive to having the next big innovations right here in Hong Kong. The Government’s role in is that of a facilitator. It’s our job to lay down the foundation, including building the financial infrastructure for the faster payment system, setting standards for the common QR code, reworking the guidelines to welcome virtual banks and ensuring an abundant supply of talent. We hope that they will help the industry focus on creating solutions for their customers and for our society at large. We also take up the role of promoter. Certainly, Hong Kong Week, in its 3rd edition this year, is a splendid occasion in which to showcase to the world what Hong Kong has to offer. This year, Week will welcome some 8,000 executives and professionals from about 50 countries and regions, along with more than 200 celebrated speakers. For the first time, a Fast Track Programme will be added to facilitate start-ups and international exhibitors to establish their presence in Hong Kong. In addition, this year’s Week will serve as an unprecedented cross-boundary event, moving from Hong Kong to Shenzhen on its final day. That will give participants the extraordinary opportunity to visit companies and network with their stakeholders. The cross-boundary event will be an excellent opportunity to showcase the unique role of Hong Kong as a conduit to the Guangdong-Hong Kong-Macao Greater Bay Area. Consisting of nine cities and two special administrative regions and with a population close to 70 million, the greater bay area can offer Hong Kong a huge market, talent as well as complementary advantages of other cities, which will fuel Hong Kong’s development. Hong Kong’s participation in the greater bay area development will get a huge boost later this month. As you all know, the high-speed rail linking Hong Kong to Shenzhen, Guangzhou and the rest of the Mainland of China , with the terminus right here at West Kowloon, will begin operation on September 23, which is 11 days from now. 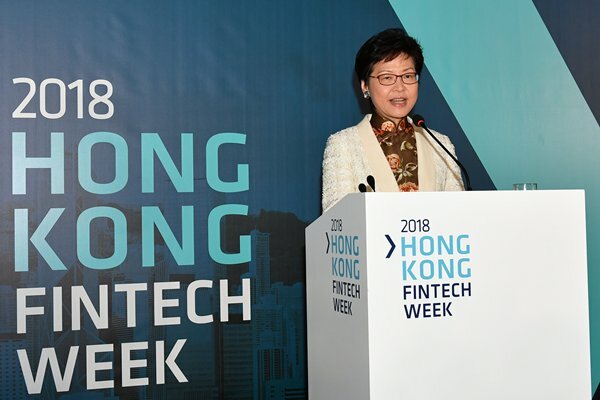 Chief Executive Carrie Lam gave these remarks at 2018 Hong Kong Fintech Week on September 12. At its most basic form, insurance offers protection. It is, in short, a form of risk management. Lingnan, of course, is the only University Grants Committee funded tertiary institution offering a degree in Risk & Insurance Management. For this term of government, we are determined to play the proactive role as a facilitator and a promoter and to drive Hong Kong’s economic development in a forward-looking manner. We will actively pursue new opportunities and to support industries that Hong Kong enjoys advantages and potential. We set up the Financial Leaders Forum in August last year, which is chaired by myself and comprised of prominent members from the financial services sector as well as top leaders of our financial regulators. The main objective of the forum is to examine strategic proposals that will further enhance Hong Kong’s position as an international financial centre. One of the issues discussed by the forum is how to further the development of the insurance industry of Hong Kong. In this year’s government budget, I have also asked the Insurance Authority to work with industry stakeholders to explore ways of enhancing Hong Kong’s competitiveness as an insurance hub, including introducing tax arrangements and modifying other regulatory requirements. In July, the China Banking & Insurance Regulatory Commission announced an arrangement that when a mainland insurer cedes business to a Hong Kong qualified professional reinsurer, the capital requirement of the mainland insurer will be reduced. This preferential treatment will facilitate co-operation between the Mainland and Hong Kong in cross-border reinsurance business, and enable Hong Kong’s reinsurers to enjoy competitive advantages over other offshore reinsurers. We will also enhance Hong Kong’s attractiveness as a domicile for captive insurers set up by mainland enterprises. With the passage of the relevant amendment bill by the Legislative Council in July 2018, the 50% profits tax concession has now been extended to cover both offshore and on-shore risks. In addition, the Insurance Authority will collaborate with the Insurance Society of China to set up a Mainland-Hong Kong Captive Research Centre to enhance our technical capacity for developing captive insurance business. I am sure many of you are aware that Prudential, one of the leading insurance groups in the UK, has recently announced it will demerge into two separate companies. And Hong Kong will become the main regulator for the company focusing on businesses in Asia, Africa and the US. We will continue to work hard to attract more overseas insurance companies to choose Hong Kong as their base for offshore operation and for expanding businesses to China and Asian markets. Looking ahead, the grand and visionary Belt & Road Initiative will provide unprecedented opportunities for Hong Kong as a whole and the insurance sector in particular. Infrastructure development is a key driver of the Belt & Road Initiative. The Asian Development Bank estimates that as much as US$ 1.7 trillion per year is needed for infrastructure investment in Asia until 2030. In a recent forum, the China Property & Casualty Reinsurance Company Limited, a subsidiary of the China Reinsurance Group, estimates that from 2018 to 2022, the Belt & Road Initiative will generate about US$16 trillion in risk protection demand for engineering insurance and property insurance. Hong Kong’s deep pool of multicultural talent in law, accounting and finance can help manage these risks, by conducting legal due diligence, structuring the optimal deal through a combination of financial engineering as well as insurance and reinsurance arrangements. Hong Kong is home to a cluster of 160 insurers and reinsurers. We are well positioned to fill these gaps in the supply of insurance to support infrastructural developments under the Belt & Road Initiative. On the other hand, the development of the Guangdong-Hong Kong-Macao Greater Bay Area will provide fresh impetus for Hong Kong’s economy and our insurance sector. The Greater Bay Area covering Hong Kong, Macau and nine prosperous cities in the fast growing Guangdong Province, has a total population of 69 million and a collective GDP of about US$1.5 trillion, which is similar to the size of Korea. From Hong Kong’s perspective, it means a potential market nine times the size of our population. And that can only pay dividends to our financial services sector. For you. Hong Kong Trade Development Council survey notes that middle-class mainland consumers allocated about 27% of their household income to financial investment and insurance in 2017, as compared to just 16% in 2013. The Hong Kong Special Administrative Region Government is striving to widen market access for our insurance sector in the Greater Bay Area. As a first step, we have proposed allowing Hong Kong insurers to set up post-sales service centres in the Greater Bay Area. This would serve mainland policy holders of Hong Kong insurance, as well as Hong Kong policy holders living or working in the area. We are also in discussions with the China Banking & Insurance Regulatory Commission to enable the distribution of Hong Kong insurance products throughout the Greater Bay Area. That can only expand both opportunity for the industry and choice for the people in the area. 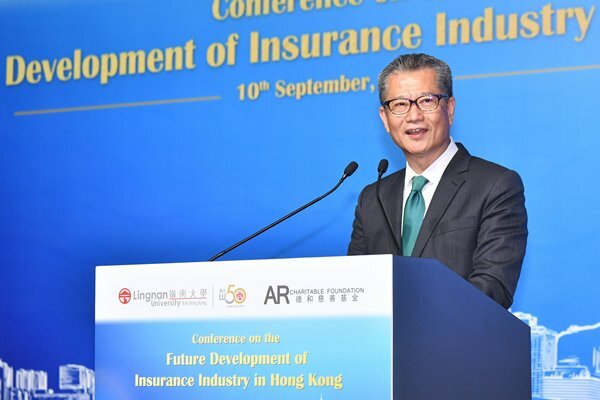 Financial Secretary Paul Chan made these remarks at the Conference on the Future Development of Insurance Industry in Hong Kong co-organised by Lingnan University and the AR Charitable Foundation on September 10.